Leblanc prepares a morning coffee for one of his regular customers. 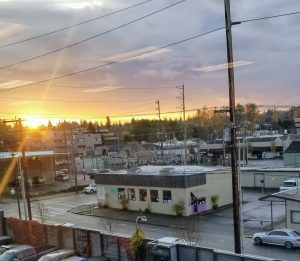 Since opening at the end of 2014, the restaurant has been rapidly transitioning from Yelm’s best kept secret to a destination spot for both former urbanites longing for a touch of fine dining and locals who care about where their meals come from. Leblanc believes that the ‘wow’ factor is an appreciation of three characteristics rarely found in small rural town eateries: transparency, artistry and an emphasis on fresh, local food. Garden to Gourmet manager Patrick Leblanc and his crew emphasize fresh, local and seasonal sources for all of their meals. “Transparency is one of our big values,” he says. “That’s one of the reasons it’s an open kitchen concept where you can actually see the action, see what we’re doing. 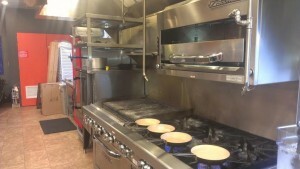 We’re not secretly putting in MSG on the side.” Chef Daniel Juarez adds, “We take that very seriously.” The open kitchen allows customers to feel good about what they’re eating, he says, because they can literally see where it came from. Juarez says using fresh, local ingredients keeps him inspired to “see what I can do for the health and well-being” of everyone who comes through the door. The open concept kitchen allows customers to literally see what goes into their meals. Customers appreciate that level of dedication. “Patrick, Daniel, and the crew consistently blow me away with their dishes,” says Andrew Wright, a videographer who moved to Yelm from the San Francisco Bay Area ten years ago. “We’ve really been missing a good sit-down, hangout restaurant with top-quality, freshly prepared meals – nothing frozen, nothing packaged.” Renee Webb maintains it’s the quality, and taste of the food along with the ambiance that make her a regular customer. Part of that ambiance is the artistry Leblanc referred to. “The plating is very important,” he explains. “Let’s do this with taste. It’s not just slapping food on a plate and giving it to you, it’s actually a little work of art. It’s all tied together with the environment.” Most restaurants in his price range ($10 – $14 a plate) don’t take the time to add those extra touches, he says. 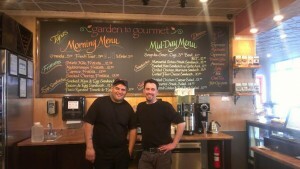 Chef Daniel Juarez (left) and manager Patrick Leblanc share a passion for healthy food and artistry. He spent a few years as a line cook but upon moving to Washington State, switched to the construction industry for fifteen years. 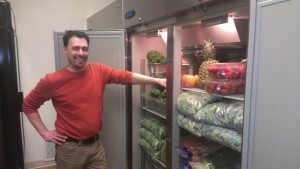 During a lull in 2013, he took a business planning class through the Thurston Economic Development Council and re-examined his passion for healthy food. 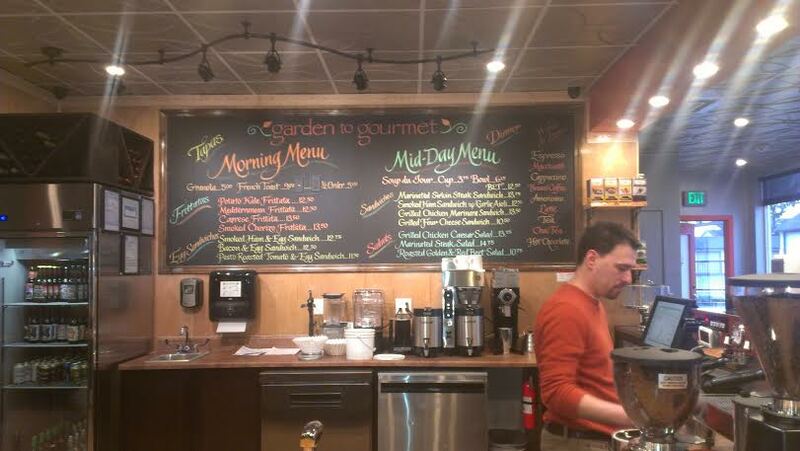 Garden to Gourmet was born, with help from a small team of investors. Monday, Wednesday and Thursday from 9:00 a.m. – 7:00 p.m.
Friday and Saturday from 9:00 a.m. – 9:00 p.m.
Sunday from 9:00 a.m. – 3:00 p.m.